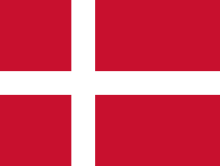 Denmark competed at the 1976 Summer Olympics in Montreal, Quebec, Canada. 66 competitors, 56 men and 10 women, took part in 40 events in 15 sports, winning a total number of three medals. Olympic veteran Arne Jacobsen was the only archer to represent Denmark in the nation's second appearance in the Olympic archery competition. He dropped 89 points from his previous mark, falling 17 places in the standings. Eleven cyclists represented Denmark in 1976. One female fencer represented Denmark in 1976. Two male pentathletes represented Denmark in 1976. ^ "Cuba at the 1976 Montreal Summer Games". sports-reference.com. Retrieved 18 April 2015. This 1976 Olympics-related article is a stub. You can help Wikipedia by expanding it.